See the work of Nathalie Djurberg (b. 1978), who uses claymation to craft and enact strange, dark tales of war, violence, and sexual exploitation in projections and installations that can be disturbing and dazzling at the same time. 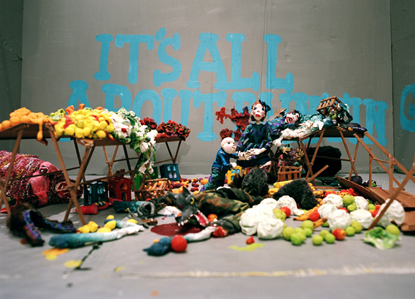 The stop-motion animation technique of claymation is most commonly associated with children’s entertainment, which only serves to heighten the peculiar power of Djurberg’s work. The artist, who was born in Sweden but now lives and works in Berlin, executes the time-consuming process of the animation on her own, with composer Hans Berg providing the musical scores. She painstakingly makes the detailed sets, clothing, and props by hand to expressively depict varied figures and environments. Her videos and sculptures dramatize difficult social and political issues with unsettling directness, while her careful hand construction and painterly use of color infuse the works with a disconcerting beauty that underscores their emotional impact. Djurberg often combines video and sculpture with Berg’s musical compositions in immersive gallery environments. This exhibition brings together four videos and a selection of sculptures from those and other projects, presenting a multifaceted introduction to a most intriguing artist. Djurberg’s work has been featured in solo exhibitions at Sammlung Goetz Museum in Munich, Germany (2008), the Armand Hammer Museum at the University of California, Los Angeles (2008), and the Centre Pompidou in Paris, France (2009). She has also participated in group shows at the Tate Modern in London (2006), P.S. 1 Contemporary Art Center (2006) and the New Museum (2008) in New York, and the Venice Biennale (2009), where she was awarded the Silver Lion for Promising Young Artist.